Families & Groups are Welcomed. Enjoy the Fantastic Socialising & Dining Spaces. The Victoria & Albert Suite is a stunning, spacious property with fantastic socialising and dining areas, perfect for families or groups of friends for holidays, celebrations or for a relaxing countryside retreat. The property sleeps 10 - 14 guests within 5 sleeping spaces and is an attached property. 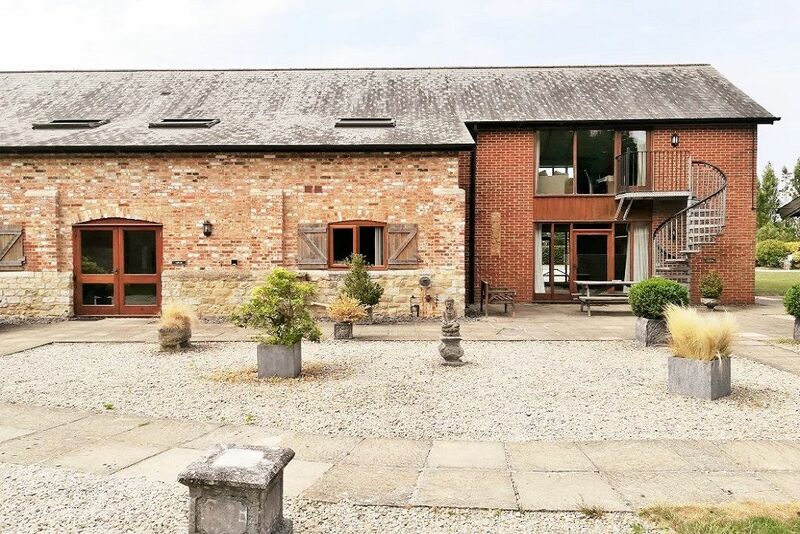 The Victoria & Albert Suite is situated on the north wing of The Victorian Barn and benefits from 3 spacious lounges, 2 fully fitted kitchens, 4 bedrooms, 5 bathrooms & lots of outside space (patios & gardens) perfect for Al fresco dining, games & enjoying the sunshine. The sleeping arrangements consist of 2 king bedrooms, 2 family bedrooms with double and single bed in each room to sleep up to 10 guests. There are 2 sofa beds within the ground floor lounge to accommodate a further 4 guests. Making 5 sleeping spaces in total. All bedrooms benefit from wall mounted flat screen TV’s and fitted wardrobes. The lounges contain sumptuous sofas and first floor and ground floor dining areas. The fully fitted kitchens have lots of fridges and freezers plus dishwashers for guest’s convenience. We are pleased to offer superb shared leisure facilities including Indoor Heated Pool & Sauna, Hot Tub, Gym, Games Room, Children’s Play Area, Fishing lakes & Super-Fast Wi-Fi. Open all year. The Victorian Barn benefits from amazing views, they are completely unbelievable and you have to come here in order to absorb them. In fact, the view from our reception is truly awe inspiring. We also offer superb facilities such as the indoor heated pool, hot tubs, gym, sauna, childrens play area, games room, activities suite and fishing lakes. 3 en-suite bathrooms, 1 first floor whirlpool bathroom and 1 ground floor bathroom. Linen and towels provided for all guests. This includes 2 pillows per person and a duvet, plus white cotton linen & 1 hand and 1 bath towels per person. Ample safe parking near to the property. Unloading of your bags can be offered just outside the property. No charge for parking. 3 spacious lounges with comfortable sofas. There are also coffee tables and soft wall lighting plus a well stocked attractions leaflet rack and welcome booklet. Range on ground floor and double electric oven on first floor both with ceramic hobs. Plenty of pots & pans, crockery, cutlery and glasses. Wall mounted flat screen TV's in all bedrooms & 2 of the lounges. Patio area, just outside the property with garden furniture, perfect for BBQ's and enjoying country living. 'Quiet time' between 11 pm & 8 am. Communal hot tub for guests to share, shared between 4 other properties, available 8 am until 11 pm daily. There is a soft play centre just 3/4 miles away and the Jurassic Coast is just a 30 minute drive.